Tirupur is known as the hosiery hub or knitwear capital of India. A small town in South India, which exports to all parts of the world in a big way. I was here for a work assignment, sourcing new vendors for my business. We boarded a bus from Bangalore, excited about the 4 hour road trip to the textile town of Tirrupur. As soon as the bus started, there was a South Indian movie started on the TV screen, curtains drawn, the air condition on, everything ready to get one to sleep enroute the ride. However, the bus driver had intentions otherwise. He had to ensure that not just the passengers, but also every other driver on the road was wide awake while driving. Hence, every now and then, he would honk a loud continuous horn, which became his USP. If he didn’t honk within 15 to 20 seconds, we feared he had fallen asleep! Before the thought could move to the next, there it was, the loud, annoying, perennial horn. Well, amidst jokes, short naps and requests to the driver to have mercy on our ears, we finally reached Tirrupur. That is when I realised that this honking characteristic wasn’t restricted to bus drivers alone. Everyone in this town, from an auto to a private taxi driver would honk, even when not required. It was as if they had conversations with each other through the horns. Like a honking code language. A taxi 500 metres away from the car in front would honk honk, as if informing the car ahead of his arrival. Then 200 metres down, a horn to confirm if the car ahead was aware of the taxi’s arrival. Another 100 metres and a horn would say, hello, am coming close. This was followed by a continuous chatter (non-stop honking) saying I am speeding up, I want to overtake, hello ….. do you hear me?! Give me space my dear! Hello hello! Make some space, now I am overtaking you and there I did it! Phew! Just when you think, the horn needs some rest for its throat, the driver is after another damsel, probably a red Chevy Spark. She is still 500 metres ahead you see, difficult to gauge which damsel it is! It doesn’t feel so bad in Bombay, but the honking habit is definitely becoming more chronic than it was in the past. I learnt driving from my Grandfather and he always asked me to use the horn only when required. The particular situations were never mentioned becuase they were few and far between. This was in the 1980s. Now, we honk when we want to overtake. We honk when we get impatient at the signal and the car in front takes 1 second more to start. We honk when we want to change lanes. We honk early in the morning or late at night, oblivious to the calm and quiet around. We honk outside a hospital. We honk outside a school. We honk to announce we are speeding. We even honk in the rains to push the car in front to drive faster. Also, correct me if I am wrong. Is it just me who feels the noise of the horns of today more shrill than they were in the past? Like they were calmer, more soft spoken horns as against today’s attention seeking horns. I spoke to autowallahs in Bombay and asked them if the noise doesn’t bother them. After all, they are on the road for a longer time than us commuters. While some agree and reduce the intensity, whilst others rebell stating there is no other way to get the cars to listen. Who is the cars? It is us people driving them right? Who doesn’t listen? We the people, isn’t it? The chauffers in the cars blame the autowallahs, the auto drivers blame the chauffers in the car and the cycle continues. 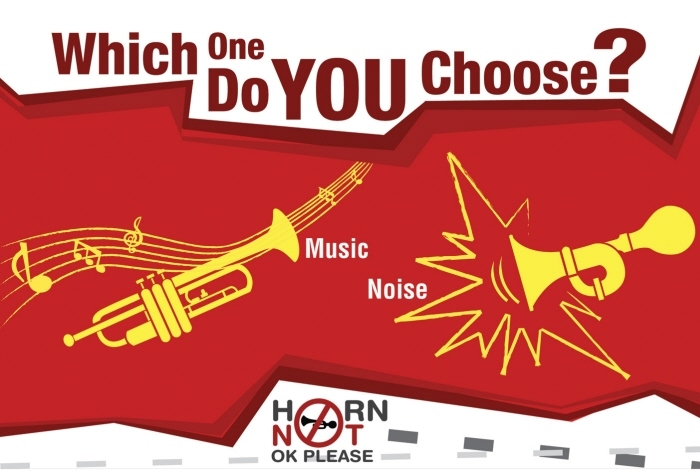 According to an article in the Times of India dated 30th April 2015, State transport commissioner Mahesh Zagade, issued a circular banning the use of the phrase ‘Horn OK Please’ on the rear of trucks and tempos. 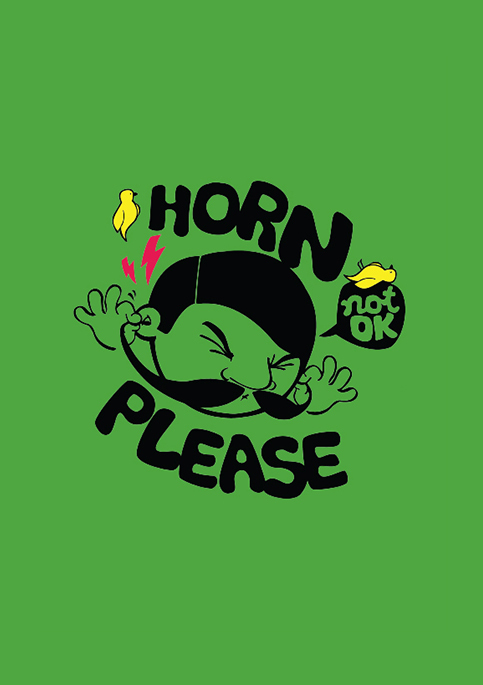 The article states that displaying the phrase “Horn OK Please” is a gross violation of Section 134 (1) of the Maharashtra Motor Vehicle Rules. High time some action is brought on the road now.